Susie is having a contest over here. Yarny prize, all you need to do is tell her a joke. Yarn snobs may sneer. 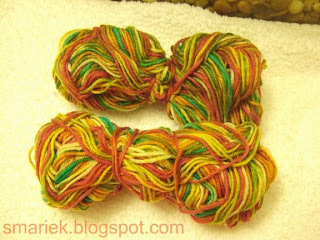 I love this sock yarn (Ravlink). This is my second time knitting with it; first pair here. The yarn feels nice in my hands. Could it be the aloe? Like the other H&S pair, this one also starts at the toe. It's also the same k2p2 rib.The only difference is that I decided to try SRH again. Hey, it's getting easier! I did have a bit of a wrinkle with the SRH on Sock1, where my stitchesinlimbo didn't match up on the left and right sides. This happened when I was adding those side stitches back into the center batch of stitches. And i don't mean being off by 1 or 2 sts. It was way off, like 4 or 5 sts at some point during that process. I have no idea what happened there. I suspect I didn't concentrate as much as I should have while I was bouncing around in the car because I worked on the heel during the drive back from the big lake (lake photos here). 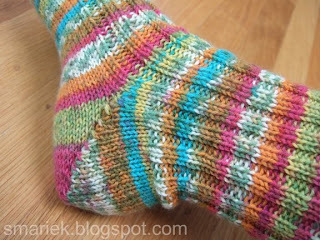 I did better with the heel on Sock2, paying more attention. My st count matched on both sides the entire time. You can see the socks side-by-side here. Notice anything odd? Yeah, the colors don't match. It's most noticeable with in the whitish sections, where you'll find more green there on the right sock than on the left sock. The other shades are slightly off too, just not as noticeable as that whitish section. The green on the left sock is more yellow than the one on the right sock. The weird thing is that the lot# for both balls of yarn are the same! So what's up with that? Since I botched up the heel on Sock1, I imagine it to be a bit lopsided due to compensating to fix the prob. I haven't looked that closely to see whether this is the case. I need to improve the heel section, i can still see holes. You can see it is the Sock2 heel photo. I'm sure more practice will fix this. Well, I guess I should be happy that I managed to get the stripes to match up more or less in both socks. 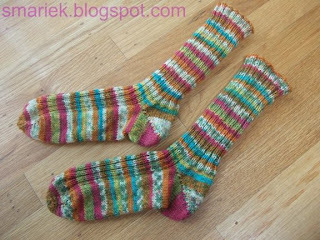 Sock2 (left) is 2 rounds shorter than Sock1, because I wanted the tops of both socks to end with the same color. You can kinda see how obvious it is when looking at the topview photo. Here's my leftover yarn from both balls. You can see that the top one is slightly darker than the bottom one. I don't know why I didn't notice the difference with the two full balls of yarn; I just assumed they'd be identical since the color/lot# were the same on both balls. -- Start rib backside @ rnd59. -- 123 rnds total b4 bo to maintain orange color at top of cuff. V lost the foam covers that came with her earbuds and complained that her earbuds now constantly fell out while she was at the gym. She also mentioned searching all over for replacement covers and ended up paying $10 for a pack of 5 pairs of foam iPod earbud covers. So I thought surely it must be possible to knit some for her. It took 6 tries before I got the 1st earbud the way I wanted. The challenge was partly due to working on so few stitches using itty bitty pointy sticks, it was just awkward. The other 3 covers were much easier after finishing the first one. I finally finished Book 3. Yay! But I think I shoulda read Book 3 before Book 4. It would make more sense. I think I like Book 3 more than Book 4. I need to reread Book 2; I didn't like it that much the first time, perhaps my opinion will change with a 2nd reading. I've planned another little trip for the end of this month. Thought we'd go to this national park but couldn't get lodgings at such short notice; surviving a Dalek attack would be easier than procuring lodgings there. Thought we'd go to LV but the plans didn't come together, plus I wasn't looking forward to flying and the heat there. Briefly thought of a quickie trip to these islands, but it just wouldn't be right to go all the way there for just 3 or 4 days. We've gone there before, for 2 week long trips, and even that wasn't long enough. I wouldn't want to rush things there. Thought about wine country city S, ultimately decided on spending time in wine country city H. We've been there before, staying at this B&B. I'm hoping to get my hands on this teen fiction before we go on our little trip. Megan originally recommended the book to me, then I later discovered that Sara had read it and also liked it. She thinks the novel was recommended to her due to her liking N Stephenson's novels. So I have the feeling I'll enjoy this book too, since I'm also a NS fan. I feel like I've been dumbed down, reading only teen fiction these days. Thanks so much for mentioning my contest on your blog! 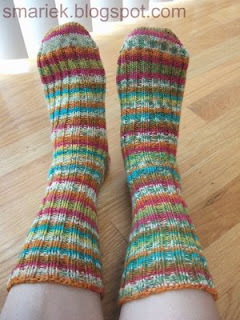 You are so right about this sock yarn, I love wearing the socks I knitted with this yarn. The dye lot thing is surprising though. Have a great weekend. Have a great weekend! Are you going to KIP? Your new socks look great. Love the new socks and the ear bud covers are totally cute! 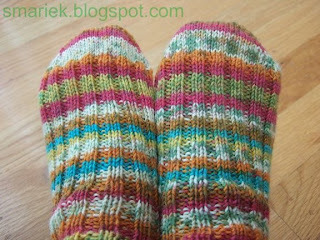 Yep I am trying to get as much sock kniting I can on "practice yarn" before I start using my good yarn!! ;op I haven't tried the RH but have the Lion Brand (w. aloe) over here now...and it still feels scratchy LOL. Great for you on still trying the SRH...that is the last heel I need to try toe-up! And hope you enjoy your trip this month!! I think earbud socks in Esprit might be the ticket. Need some? 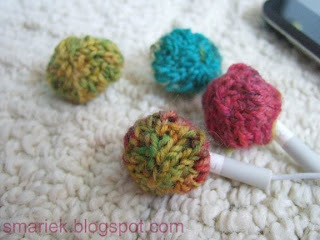 Those earbuds are adorable! What a great idea!! Good to know that you approve of the RH yarn. I bought some a couple of weeks ago. 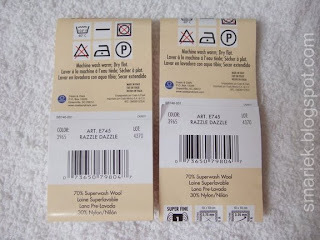 That's odd that the two skeins were different despite being the same lot number. 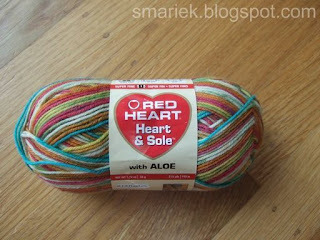 Must check out my skeins before starting my socks!! Did you contact Coats and Clark? The socks look great. I do SRH exclusively. You have to pick up a stitch in between the last heel stitch and the first stitch on the next needle (top of foot?) and knit them together to close the gap. Now I don't have those unsightly gaps! But you are doing great!! !